Fingerlings are available at gourmet stores, wholesale clubs, and even grocery stores. Plan to make the dressing while the potatoes cook. 3. Bake green beans at 425° for 12 minutes. 4. 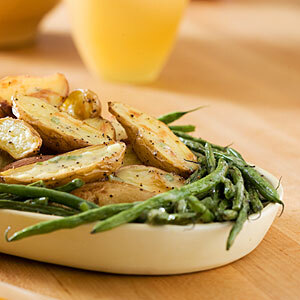 Arrange green beans around roasted potatoes on a serving platter. Drizzle with Creamy Tarragon Dressing. *1 1/2 lb. small red potatoes, halved, may be substituted with a bake time of 35 minutes. 1 1/2 lb. russet potatoes, quartered, may be substituted with a bake time of 40 minutes.